There are quite a few game-streaming services out there. Today we compare Steam In-Home Streaming with Remotr in terms of accessibility and controls. That’s right! It’s time for the streamers face-off. ROUND 1 - Devices and network. Steam In-Home Streaming is designed for streaming from one computer to another - and that’s about it. Currently you can stream games from Windows or Mac OS based PC to Windows, Mac OS X, Linux, or SteamOS. We recommend using a wired network for the best streaming experience. People have had some success with powerline networks and wireless N and AC networks with good signal, though your experience may vary. Recommending wired network may seems a little odd, but it shouldn’t be shocking - it’s not called In-Home Streaming for nothing - it’s a service designed to access your PC in next room - not across the globe. Remotr was designed with mobiles in mind - so it covers a lot of devices. You can stream from Windows PC to Android, iOS, Windows 10 (both desktop and mobile version). Linux and Mac OS versions of streamer are coming soon. Remotr is optimized for streaming over Wi-Fi and mobile data transfer network. You can play your PC games remotely as long as both your PC and mobile are connected to network. Remotr uses about half the data streaming from Netflix use. These are the max values - for games with a lot of action like Witcher 3 or Doom - for games that are less visual-heavy the numbers are even lower. 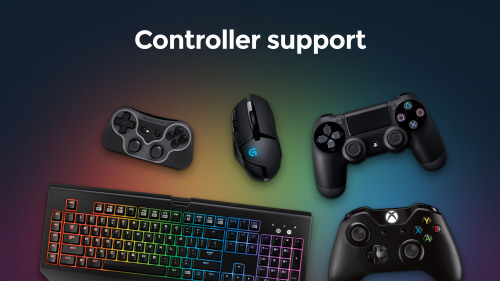 Being In-Home service Steam supports physical controllers only - keyboard, mouse and gamepad. Remotr supports controllers for mobiles - you can play using gamepads, keyboard, mouse - but you are not limited to that. Your Android TV box comes with a nifty remote? You can play using that! Having to carry around additional controller might be bothersome when playing on mobiles - that’s why Remotr comes with powerful on-screen interface editor. That’s it for now - follow our blog for LATEST NEWS ABOUT GAME STREAMING.